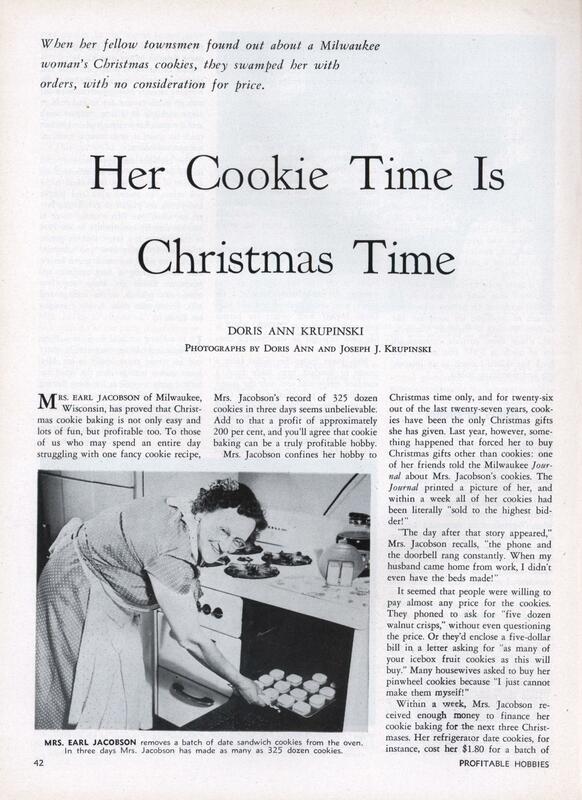 Within a week, Mrs. Jacobson received enough money to finance her cookie baking for the next three Christmases. Her refrigerator date cookies, for instance, cost her $1.80 for a batch of six dozen. She sold them for 75 cents a dozen—a profit of $2.70 for just one batch. Other types were even more profitable. As you may have suspected, however, the friends, neighbors and relatives who had received the cookies in other years were extremely disappointed—and most of them were not the least bit bashful about saying so! Those of you who might like to begin cookie baking for profit would do well to remember that only the best-tasting, prettiest and most perfect cookies will be easy to sell. Cookies which are not perfect in looks, cookies which lack something in flavor or keeping quality, are the kind of cookies which anyone can make. By following Mrs. Jacobson’s suggestions, however, anyone should be able to make the perfect products which have made her so well-known in Milwaukee. As proof of the keeping quality of her cookies, Mrs. Jacobson has kept samples of her 1946 cookies in a covered container, and they are just as delicious as if they were weeks old instead of years old. The highest quality ingredients may cost more, but, on the other hand, you can then command a higher price for the product. Asked how she makes so many cookies in such a short time, Mrs. Jacobson smiles. “I do it by assembly line methods,” she explains. “Before I start mixing, I chop up all the nuts and fruits for the recipes. I’ve found that the so-called ‘ready-cut’ fruit always comes in chunks too large for cookies, so I buy whole candied fruit and cut it up myself. On the day she begins making the cookies, Mrs. Jacobson first mixes all the batches of refrigerator dough and puts them in the freezing compartment to chill while she mixes other types of cookie dough. One very important point is to have enough mixing bowls, measuring spoons and measuring cups handy for all this preparation. If you stop frequently to rinse out utensils, it slows you down considerably. If possible, have five large measuring cups—one for dry ingredients, one for liquids, one for butter, one for fruits or nuts, and one for molasses or syrup. If the latter is greased before using, the molasses will slide out without any trouble. It is wise to have two sets of measuring spoons—one for liquids and one for dry ingredients. Mrs. Jacobson recommends having a good supply of cookie sheets and pans. She arranges cookies on the cookie sheets while others are baking in the oven. As soon as those in the oven are done, she can slide another filled sheet in without wasting a moment. One of the most difficult cookies for the average person is the pin-wheel, so we’re going to give you Mrs. Jacobson’s recipe and her suggestions on how to make them perfectly. Cream butter, add sugar gradually, then egg yolk and beat well. Sift flour, baking powder, and salt, and add to mixture alternately with milk and vanilla. Mix well. Divide dough in half, and add melted chocolate to one part. Now here is Mrs. Jacobson’s method for making perfect pinwheels: Invert two eight-inch square cake pans and place a greased and floured square of waxed paper on each. Then, using plenty of flour on your hands, pat the dough evenly onto the waxed paper. It will be quite sticky. Put chocolate on one pan, vanilla on the other—right to the edges of the paper. Pat the layers smooth with the top of a canister dipped in flour. Chill the layers separately—not in the freezing compartment this time. Chill the vanilla one hour, the chocolate only forty-five minutes. Be sure to take the chocolate layer out of the refrigerator fifteen minutes before the vanilla— don’t do it by putting the chocolate in fifteen minutes later and removing them at the same time. Then pick up the stiffened layer of chocolate, flip it over quickly on top of the vanilla and remove the top waxed paper. Next, roll the two layers up, being careful not to leave any air spaces between them. Wrap the roll in waxed paper and chill for two hours in the freezer. Cut into thin slices and bake in a 375-degree oven for ten minutes. This makes three dozen of the best cookies you ever tasted! Another especially good Cookie which Mrs. Jacobson makes is a refrigerator date cookie. In contrast to the pinwheel, anyone can make this cookie easily, although it tastes as if it must be difficult to make. Cream butter and sugar. Add eggs and beat well. Add nuts and dates which have been put through food chopper. Mix soda in a tablespoon of water and add to the mixture. Add flour and salt and mix well. Shape in rolls two inches in diameter. Wrap in waxed paper. Chill until firm. Slice thin and bake ten minutes at 400 degrees. Makes six dozen cookies. With two recipes such as these for a nucleus, any housewife can make cookie baking a profitable hobby, Mrs. Jacob-son believes. She herself has added to her “best recipe” list each year, and usually makes about twenty kinds each Christmas. Among others, her collection includes recipes for bishop’s bread, walnut kisses, anise drops, and butter cookies with macaroon topping, as well as most of the better known types of cookies. Actually that is not as difficult as it may seem. 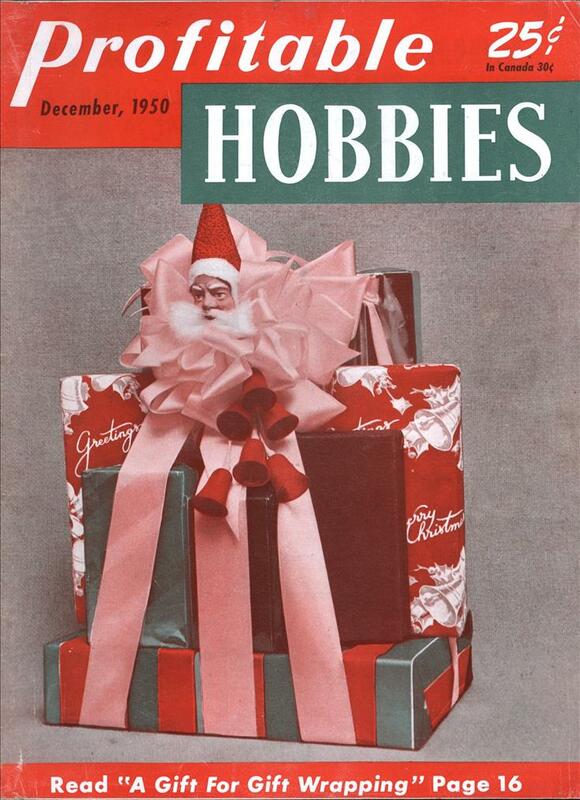 Most newspapers feature holiday articles about good cooks in the community. To get yourself well-known as a cookie maker, pass samples of your finest products around to friends and relatives. During the inevitable praise which will follow, suggest that some friend call the local paper and tell them about your prowess. A write-up in a newspaper constitutes the kind of advertising money cannot buy. It was Mrs. Jacobson’s experience that the one story brought in as much business as she could handle. However, since not every cookie baker will be able to get a newspaper write-up, there are other methods suggested for promoting cookie sales. As you pass samples of your cookies around to friends and relatives, mention that you are now making your cookies for sale. You’ll find that a surprisingly large percentage of your own friends are potential customers. Perhaps you will want to have printed handbills made and distributed throughout your city, or perhaps you will want to place an advertisement in the “Good Things to Eat” column of the classified advertising section of your local newspaper. Both of these methods are very good. If you don’t feel that you want to spend quite so much on advertising, however, you would do well to contact local bakery shops and catering companies directly. Caterers use fancy cookies for buffet luncheons and other affairs, and you may find one company which will take all the cookies you can make. Many bakery shops which carry delicious cakes and pastry would like to add an equally good line of cookies— all you need to do is find such a shop by contacting the managers. There is one drawback to merchandising your cookies by either of these methods. You would have to sell them at a large discount—perhaps thirty or forty per cent—because the bakery or caterer must make a profit on sales to the ultimate consumer. Consequently, if you can invest even a small amount in advertising, your profits will eventually be much larger. By selling direct to the consumer, there is no middleman to take a slice of your profits. At one time Mrs. Jacobson even thought of opening a cookie shop of her own, but decided that she only wanted a hobby and not a business. Cookie baking need not be only a Christmas hobby. Experiments with cookies suitable for Valentine’s Day, Easter, St. Patrick’s Day, Independence Day, Hallowe’en, and Thanksgiving prove fruitful too. And there is a year ’round market for fancy cookies for tea parties, wedding receptions and birthday celebrations. Mrs. Jacobson’s husband also feels that his wife’s cookies are what makes Christmas worth while. He can have his choice of all the delicious, perfect cookies which half of Milwaukee is clamoring for. And what is Mr. Jacobson’s top favorite?— peanut butter cookies—plain, old-fashioned, unadorned peanut butter cookies!